Just having your app in the stores is a great way for agents and consumers to find out about your agency. But what can you do to maximize this opportunity? We've compiled a few resources and tips to help you get started. A good place to start is to review the marketing materials Apple and Google provide. These include both approved images and guidelines for each entity. Improve your app's visibility in-store search results. App name - While the app name on devices needs to be kept relatively short, this is not the case for the name in the store. Instead of simply branding the name to your agency, try to incorporate keywords an agent would use to search for apps (i.e. instead of naming the app "ABC Agency Mobile" try "ABC Insurance Quotes" or "Life Insurance Quotes by ABC Agency"). If you would like to change your app name, email the change to support@ixntech.com with the title "[Agency] App Name Edit" and we will make the change when we submit the next app update. App Description - Incorporating keywords into your app description can help boost your app in searches. This is especially true in Google Play as Google takes keywords directly from the description to determine what searches your app should appear in. If you would like to change your app description, email the change to support@ixntech.com with the title "[Agency] App Description Edit" and we will make the change when we submit the next app update. App Store Keywords (Apple) - For apple, there is a section during the submission of the app to stores where you can input keywords. If you would like to add or change the keywords associated with your app, email the list of keywords to support@ixntech.com with the title "[Agency] App Store Keywords Edit" and we will edit the keywords when we submit the next app update. Encourage users to rate the app. - The more and better ratings your app receives, the higher your app will show in the results of keyword searches. Reply to reviews of your app in the stores. - The stores reward app owners who are engaged and responsive. Download the app - Apps with a higher download rate appear higher in the rankings as well. Encourage existing members of your agency to download the app. Add Links and Badges to your existing marketing avenues. You can easily advertise your app in the marketing you already do for your agency. 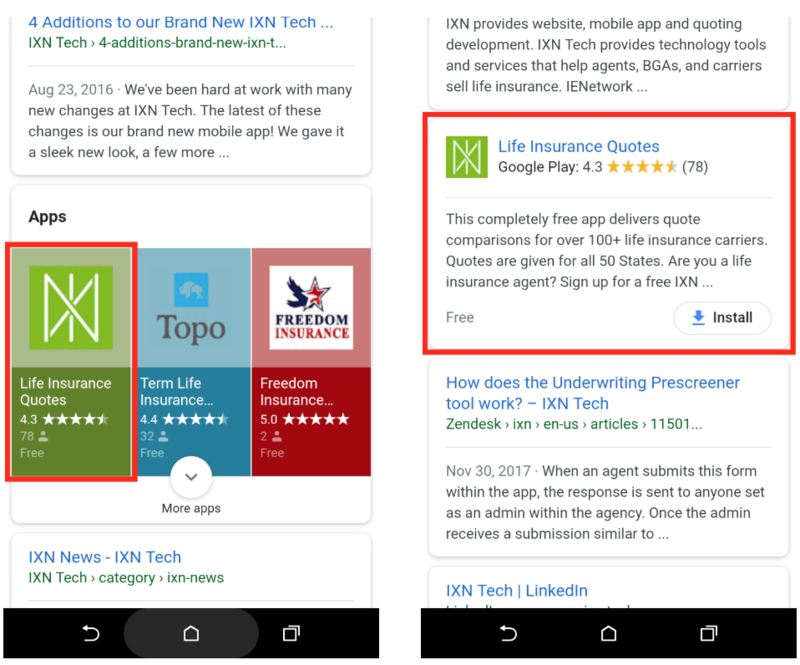 Adding the "Download on the App Store" badge and the "Get in on Google Play" badge (see Apple and Google links above) is a great way to catch the eye and add credibility to your app. Adding store links to the badges will make them even more effective. How do I find the URL for my app in the App Store? Log in to your App Store Connect account. Scroll down to Additional Information. Click View on App Store. Copy your Apple App Store URL. How do I find the URL for my app in Google Play? Log in to your Google Play Console. Hover over the information icon. This will be located on the right side of the app name at the top of the page. Copy your Google Play URL. Where are good places to put badges and links? Here are some suggestions just to name a few. Add a pop-up to your website or a mobile banner. We HIGHLY recommend adding download links to your website. This will make it so your app appears in search engine result pages. You can use the strength of your website to market your app. What about print materials? We suggest using a QR code generator to add the download links to your printed marketing materials as well! While this is certainly not an exhaustive list of marketing methods, we hope these tips help you get the word out about your app. Before you know it, your tools will be in the hands agents and consumers. Good Luck!